On how to even the load out? I'm guessing it matter too? Thank you oogway. I take my pup on dayhikes much more than backpacking, but he still backpacks with me every once in a while. There are a lot of good options out there, and I've been extremely happy with a used Granite Gear dog pack. Balancing the load is very important, beyond that I'd ease the dog into it. Look for discomfort, and slowly add weight/increase mileage... I've heard very good things about Ruffwear dog packs, but have no experience with them. I have a pal that takes his dog everywhere, and uses the Outward Hound brand. Here https://picasaweb.google.com/otto.stover/TurRundtSulisfjelleneJuli2008# is a tour me and my dog took in the mountains about two hours driving or so from where I live. Since it was just the dog and me, all the pictures was with the dog. He is a large Border Collie, about 30 kilo, and on this trip he had twelve kilos in his pack. No problem at all. It is important that the pack does not go too far down on the sides. You see that all the weight is in the sidepockets. The stability is better then. I used a scale to weigh each side before putting it on him. After that I just slipped a small stone into the side that was lightest if there were some unbalance. After a few tries it was ok. The rule here in Norway is that a well trained dog may carry half his weight. But you always start small like Sean told you. Make it fun for the dog. Then you will have so many nice trips together. I am going to travel with my tuddu(doggy) and I am looking for more advices here. Hope I get some as soon as possible. I used dog packs in the 1970s that were very primitive. I like some of the newer ones much better. Buy the right size, balance the load, and reef up on the straps. Practice at home so your dog is used to the compression of the straps. 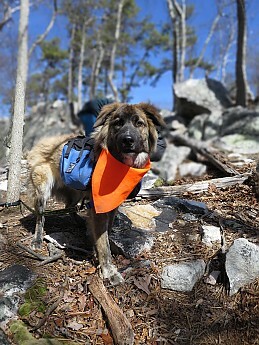 Outdoor dogs adapt to the use of packs readily and act like they are proud of carrying stuff. I have been using a ruff wear pallisades dog pack on my siberian husky for like 6 or 7 years now i think. Probably has at least 1,000 miles on it if not more. Other than being a lityle dirty its still like new. holds up great, durable as heck, pack bags remove from the harness. I can fit 10 days of food, tie out cable,food and water bowl, accessory strap and a biner. I strap a blanket onto the outside also. I was looking at Ruff Wear and Mountainsmith packs yesterday. Both are well made with many points of attachment. The areas with potential chafe are covered. They are far better than the older packs. Outward Hound makes a very serviceable pack for less money. In addition to the helpful first-hand info above, have you checked out the reviews of dog packs on the site? Thank you all for such wonderfull advice. Now I have my reo divdin back and coupons. I think I'll go with the ruff dear pack. He is my daughter's dog but goes hiking with us. As you can see from the picture he is a black lap mix. Living in western north Carolina. We think orange would be best for his safty. I wonder if REI would do a pack fitting for me? Hummm after all they did it for me.... once again thank you all. On a side note projectpawsalive.org and other groups are great to donate too for our police and military K9 protectors. Just bought an Outward Hound pack and it arrived yesterday. It will be good.